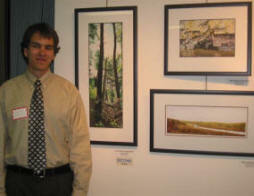 Michael Ajersch Michael is originally from Ottawa and has just recently moved to Deep River. 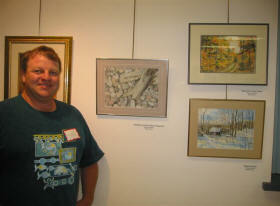 He has been painting and drawing since childhood, but has only seriously started dabbling in watercolors since 1999. 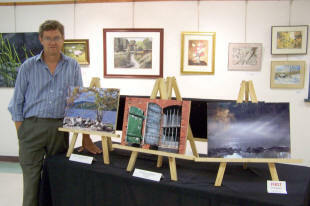 His favorite subjects are Canadian wilderness landscapes, especially Shield Country scenes typical of the Ottawa Valley area.Michael prefers to keep painting as a semi-serious hobby, claiming there is more money to be made as an “average engineer” than as a starving artist (hence his day job at AECL!). He occasionally manages to sell the odd painting, though. 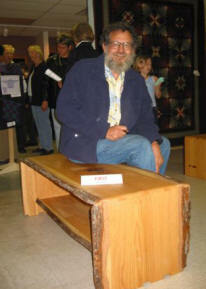 Samples of his work can be found on hisweb page. 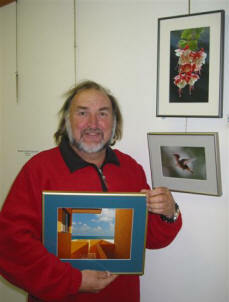 Richard Baynes Richard’s work is multimedia, using acrylics as the primary paint. Abstract in nature the work comes alive under various lighting situations. 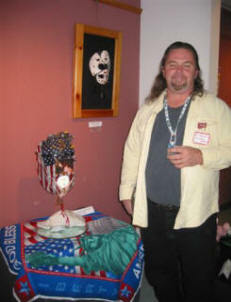 He uses found art and supplies to create most of his work in a Jackson Pollack style.Laurie Ann has been a freelance writer for 30 years and often combines writing with the art for reflection.Together we have become known for the multi-media impact of art and writing, then adding creativity workshops to our shows. “Story Board I” Installation $325 The ancient continuum of the ever mingling of star dust with human form, and the spiritual energy rising out of the existence of all things. “Pieces or Whole” Installation $450 If we could see spirit, our souls, our connectedness…we would see the interaction of energy, flowing, forming, spreading outward. 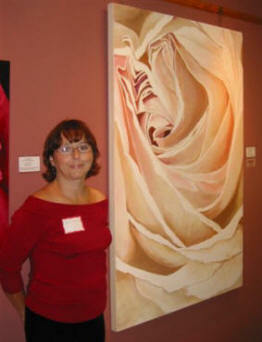 Cheryl Bellan I have been painting sporadically for approximately 10 years. I wish there was more time!!! Painting is relaxing and satisfying for me, it is a great escape. I have never had painting instruction, other than what I learn from television shows and books. One day I hope to be able to attend an art course.The farm scene is done in oil and the flowers and pathway are done in acrylics. Majority of my latest work is in acrylic. I have given my paintings to friends and family as gifts. “I See Land” Glasswork This is a 12-inch circular piece, set in a wrought iron stand. It is a sailboat at full tilt in the waves, with a bit of land on the right-hand side. “Poppy – Dressed in Black” Glasswork This is an 8-inch square plate, sitting in a clear plexiglass plate stand. It is 2-sided (i.e. you can see the complete poppy from both sides) – oftentimes, with the glass fusion overlaying technique, you only see everything from one side. “The Great Blue … At Dusk” Glasswork This is also a 12-inch circular piece, set in a wrought iron stand. The “great blue” refers to both the blue sky at dusk, and the great blue heron, whose silhouette you see. There are tiny bubbles in the sky part of the glass that, given the right lighting, catch the light and look like stars in the evening sky. Sara Carlisle Sara Carlisle, born in the United Kingdom in 1958, now lives in Deep River, Ontario, Canada.She received her Ph.D. in Biology from Queen’s University in Canada, where she studied plant physiology and molecular biology.Largely self-taught, her interest in art is long-standing. 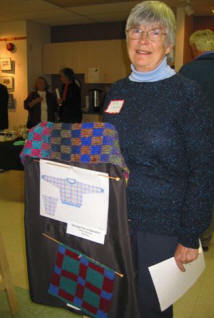 She has been a member of “From the Valley” Artisans’ Co-op in Deep River since 1996, and has participated in the Deep River Craft Fair since 1985. She has given several workshops on multi-media art in the local public school.Sara works predominantly in watercolour, but also dabbles in acrylic, pen and coloured pencil, photography and computer-based digital art. She was introduced recently to botanical art through workshops conducted by Canadian botanical artists Kathryn Bourbonniere and Pamel Staff, and found it provided an ideal way for her to combine her interests in art, botany, and gardening. 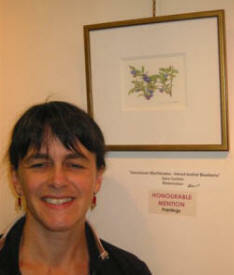 She is a member of the American Society of Botanical Artists, Botanical Artists of Canada and the Deep River Association of Botanical Artists, and has exhibited at local group exhibitions in Deep River, Ontario, and Pembroke, Ontario, at Ottawa’s Tulip Explosion in 2003, in Toronto at Canada Blooms in 2003 and 2004, at the Algonquin Park Visitor’s Centre November 2004 – May 2005, and at the 7thAnnual International Juried Botanical Art Exhibition of the American Society of Botanical Artists and the Horticultural Society of New York in New York, September – November 2004. Katrina Covello Katrina Covello has been doing stained glass for 19 years and has been playing with mosaics for the last 4 years. 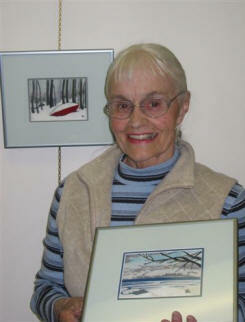 She enjoys depicting natural scenes in both mosaics and stained glass windows. Katrina currently resides in Richmond Hill with her husband and young daughter where she gardens when not creating in her studio. 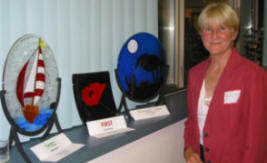 Katrina offers mosaic workshops through The Stained Glass Shoppe in Petawawa or at her home in Richmond Hill. “Eels Lake in Winter” Glass on plywood A wintry weekend at the cottage on Eels Lake. “Coneflower in Autumn Meadow” Glass on plywood, pine frame $160 A determined coneflower pushing through dry grasses in autumn. “Rustic Star Mirror” Glass on solid pine $190 Adaptation of textile colours and motif from South-East Asia. Rustic frame embellishment influenced by hand worked woodworks. 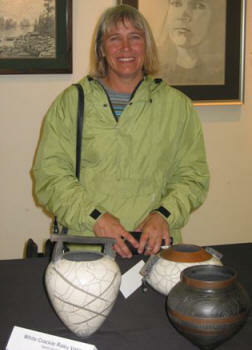 Eva Gallagher A Raku course offered by the Deep River Community Recreation Department in 1968 sparked my interest in ceramics. Over the years I have taken many courses and workshops to improve my skills. I find that I especially enjoy the decoration part of the ceramic process – either through manipulation of the clay or through surface decoration. Inspiration often comes from the natural world and I find myself drawn to the earth tones – browns, rusts and ochre – for glazing. 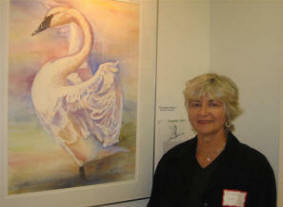 Sharon Girdwood Sharon Girdwood specializes in wildlife and nature art. Her realistic depictions of Canadian wildlife in graphite are unique and finely detailed. Her work is available through several retail outlets and is always on display at her studio in Chalk River,Ontario.Sharon participates in many art shows and festivals throughout Ontario. 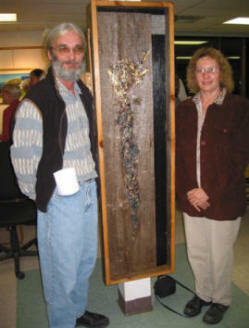 She resides in Chalk River, Ontario, with her husband and two children. Her studio serves as a framing centre, a place to create as well as a showcase for her work. “Memory Bay” Drawing – graphite Nothing speaks of autumn in Canada like the grace and beauty of canvasbacks speeding southward. Under the watchful gaze of retrievers and the grey skies of November, the migration reminds us that seasons go by and time moves on. Fall gently lets us pause andreflect on old companions, old friends. Seasons change and are forever instilled to our memory. “The Wolf” Drawing – graphite Misunderstood and feared, the wolves of Canada have long been considered an enemy of man and it is only in recent times that their true nature is being discovered. Living in tight knit family groups, this timid creature is seldom seen – preferring large tracts of remote wilderness. From the smaller brush wolf of the Algonquin region to the huge timber wolf of the North, nothing can stir our emotions as quickly as the haunting howls and piercing cries of this truly magnificent carnivore. In this image, Sharon has captured a pair of wolves investigating the shoreline of some northern river. She has also hidden six more faces. Can you find all eight wolves in the picture? “The Log Driver’s Waltz” Drawing – graphite Starting around 1800, the demand for the mighty white pine brought a new breed to the forests of Ontario. The axes of the lumbermen sang through the winter and in spring the rivers literally flowed with logs destined for the mills and eventually the shores of Britain. The log drivers that kept the timber moving were renowned for their nerves of steel, their skill on the water and especially their light feet as they danced across the floating pine. 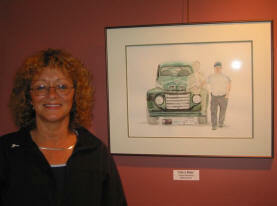 “Life’s Ride” Watercolour This painting is of a 1950 Ford F1 that my father, Bud Gonneau, restored. He owned the same truck when he was 15 years old so I painted an image of him at that age, from a photograph, sitting on the fender. Nancy Hache Painting is my passion, nothing gives me more pleasure than the WOW feeling I get when I stand back and look at a completed piece.I am a self-taught artist who credits a great deal of my knowledge and understanding from watching my mother paint in oils and sell her paintings throughout the Ottawa Valley. I have been seriously painting in acrylics for the past 2 years and prior to that dabbled with drawing, sculpting and oils.I especially love painting florals, women’s faces and the male form, layering the acrylics and building on the light as it hits the canvas. I love painting with vibrant colour and I use texture gels and polymers with the acrylics to further enhance the end result and breathe life into each piece. 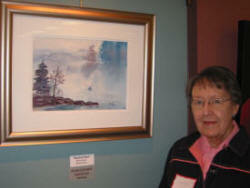 Denise Hart A native of Deep River, Ontario, Denise received private art lessons at a young age and her limited influences have allowed her to develop her own personal techniques and style.Working in watercolour, she paints a variety of botanical subjects, and conducts workshops in her area. 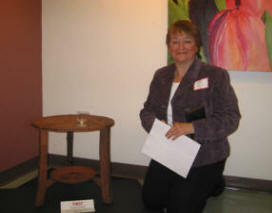 As a member of the ASBA and the BAC, she exhibited at the RHS in London, England where her work won a Silver Gilt Grenfell Medal in Feb. 2002.Denise has recently expanded her interests to include fine woodworking in the form of decorative boxes, which are inspired by the beautiful woods that she uses. 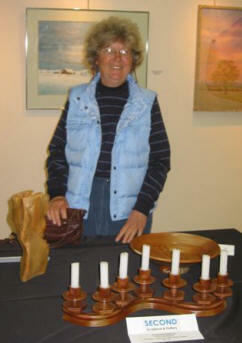 Her work can be viewed at the Valley Artisan’s Co-op in Deep River. “Exotic Box” Bloodwood, zebrawood, African blackwood, canarywood, lacewood, cumaru. Velvet lined. Hazel Herriot Hazel Herriot, B.A. Fine Arts, has been working in many media for a great number of years. 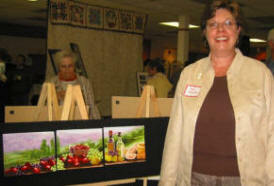 She holds a Professional Specialist’s High School Art Teaching Certificate. 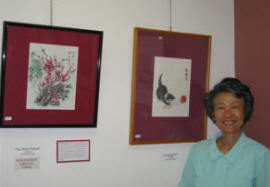 Many of her former high school students have gone to careers in some form of art. 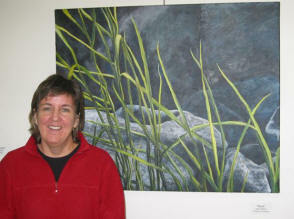 She has exhibited in many shows and galleries including the Saskatchewan Art Gallery.She takes her inspiration from nature, perceiving the rich hues in what others might see as mundane.Since graduating from university she has taken part in many seminars and workshops including the Emma Lake workshops. 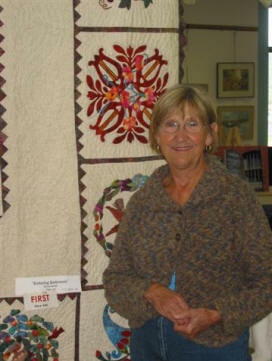 Her early interest was in painting but lately fibre arts (batik, silk screening, spinning, weaving, felt making, and dyeing) have been her primary focus. John Macgillivray I am ever a humble student of nature and the human condition and the words and works of other artists.Retiring from social work, I completed two years of training in the Diploma Program, Ottawa School of Art (1995 and 1995). 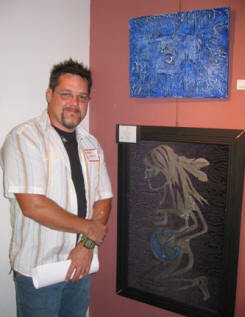 I have had two solo art exhibits and won four juried show awards. 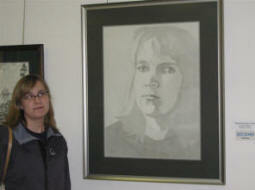 Several of my art students have also won juried awards. 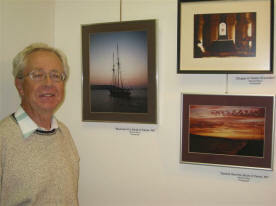 My works have been requested and sold at charitable fundraisers. Local theatre groups have requested and received my help with designing and painting scenery. In addition, I have been responsible for two murals in Québec. “Star Birth” Watercolour – assisted by gouache and acrylic inks $475 Star birth in a nebula. “Silk Garden Scarf” Knitting The charm of the chequered “Silk Garden Scarf” lies, to my mind, in the perfect pairing and progression of the colours. The scarf is knit using two balls of a Japanese wool-and-silk-blend yarn called Noro Silk Garden. Each colourway of this yarn is dyed in a sequence of colours with a long period before the colour sequence repeats. The scarf itself has two separate layers joined only where the colours reverse, making a warm, cuddly scarf with both sides the right side; there is no wrong side. The knitter of this scarf uses two balls in the same colourway, beginning with a strand from each ball at a different point in the colour sequence. The yarn designer has chosen the colours in the yarn; all colours are compatible in any one colourway. Thus, a beautiful scarf and … no decisions! “Tea.Transit.Time” Painting This work was initially inspired by a collection of tea wrappers from a research project for a colour theory class. 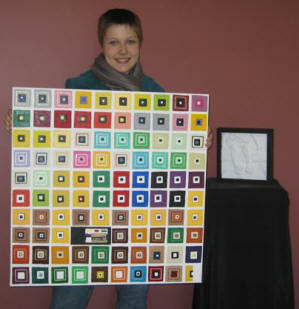 Each square represents a different brand of tea, and different flavours within that brand. The colours are a direct representation of the wrappers and the ratio of the colours on the wrappers are represented by the size of the squares. It was all very systematic, yet as the piece developed, it gained a sort of autobiographical nature in that tea was an everyday aspect of my life. I had also been collecting transit cards from the TTC- another element I wanted to incorporate. I represented the card in the same way as the tea- though more representationally rather than using abstract colour ratios in squares. Time comes into the mix in the placement of the card within the wrappers. My grandmother passed away this year, in January at the age of 73. The card represented is from January, and the placement is after the 73rd tea wrapper. Finally- to add to my organized madness and to further link these disparate elements together, the value of tea wrappers represented is equal to the cost of the monthly metro card ($98.50). The tea (bought separately at coffee shops) is one dollar- and so 98 1/2 tea bags arerepresented on the canvas. The confusing and seemingly unrelated aspects of this work mimic the strangeness of being in a new place for the first time, and the loss and chaos one experiences with the death of a loved one. “Turned Vase” Woodwork The vase is of spalted beech, about 16″(40 cm) high, with a stainless-steel insert so that it will hold a small amount of water.